음색합성법과 한국형리듬 제작법 및 다양한 옵션의 설명으로 시청 즉시 바로활용가능합니다. 한국형리듬 제작법은 프로페셔널이 아니경우에는 이해가 어렵고 작업이 불가능 합니다. 액정위의 버튼 [F1] 과 [F2] 버튼을 동시에 누른후에 악기 전원을 다시켠다. 위와같이 화면이 나올때 [F3] 버튼을 누른다. 주의할것은 [F3]버튼을 누르면 바로 초기화가실행된다. The SOLTON MS60 and MS50 keyboards are two fantastic newgeneration instruments, designed to meet the needs of musicians looking for high quality sounds combined with top level professional performance. The potential of these two incredible instruments is practically unlimited, considering that they are able to load new sounds (PCM Voices, PCM Rhythm Grooves etc.) and new musical soft-ware (MIDI backing, Styles etc.) by means of the incorporated Disk Drive unit. 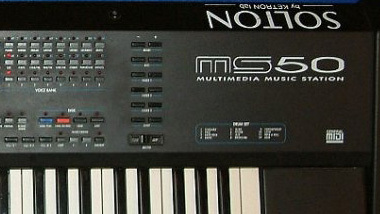 The technical characteristics of the two keyboards are identical, except that specially designed internal amplification has been included in the MS60 model. The superb sound generation of the keyboards comprises 256 Orchestral Voices specially created with Multi-Synthesis Technology. The sounds are sub-divided into 16 families according to General MIDI standards and can be selected from two separate banks. The voices have been sampled using the very latest Pulse Code Modulation methods (PCM) to reproduce the natural "feeling" and playing techniques of each instrument. In order to satisfy the demands for public and domestic entertainment, the keyboards can be connected to a normal television set by means of the optional VI 1 VIDEO INTERFACE. The screen shows the Song title, the words (which change colour as the Song goes on) and the chord name, which automatically adapts to the new key in the case of a Transposition. It is also possible to exclude the Lead Line (LEAD OFF) and the words (LYRIC OFF) as well as to Transpose only the MIDI Song, leaving the keyboard in the standard tuning. A perfect balance between the backing and the part played live (RIGHT) can be obtained by attenuating the overall volume of the backing by means of the Drums -/+ Volume keys. 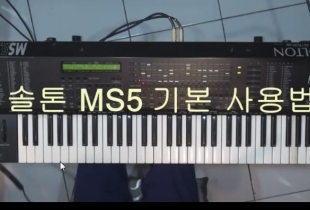 The Song can be edited by all the General MIDI parameters provided in the keyboards (Volume, Program Change, Effects, Shift, Pan Pot, MIDI Channel) the variations of which can be memorized in a Registration. While playing a MIDI Song it is possible to "book" the next one by means of the NEXT function and a Chain of Songs can also be programmed with a maximum of 32 Songs for non-stop live performances. The MS60 and MS50 are complete with 99 INTERNAL STYLES, each of which is made up of 4 Arrangements, 2 Intros, 2 Endings and 3 Fill Ins. It is possible to change the single Arranger parts (Bass, Chord 1, Chord 2 and Chord 3), modify the Program Change and Volume or play the parts manually on the keyboard in the MANUAL mode. Furthermore by means of the DYNAMIC ARRANGER and RETRIGGER functions it is possible personalize the "feeling" of your playing. The Bass is provided with some important features such as the Bass to Lowest and Sustain functions and an optional MIDI Pedalboard is available for those who want to use the keyboard for organ style playing. An exclusive feature of the Arranger is that the Accompaniment parts follow the key variations respecting the harmonic rules, adapting the intervals according to a sophisticated musical logic, instead of just simply transposing a previously memorized sequence. This very useful feature enables any harmony to be played on the keyboard with two hands, just as on a piano, with the Automatic Accompaniment following exactly what is played. The effect is obtained by pressing the optional Sustain Pedal immediately after having formed the first chord on the keyboard. The Arrangement is then maintained in the memory for as long as the pedal is pressed. The internal memory contains 24 locations into which Styles and Patterns can be programmed. Each Pattern can be programmed exactly as an internal style, with 4 Arrangements, 2 Intros, 2 Endings and 3 Fill Ins in Major, Minor and Seventh keys. It is also possible to copy any Style or part of a Style into a Pattern with a view to modifying the Sounds, Volumes, Effects, Pan Pot or Tempo. The Patterns can easily be saved or loaded to or from Disk either individually or in groups (Pattern Chains). A protection function called LOCK is also provided, to safeguard against unwanted cancellation of Styles already in the memory when loading new ones from the Disk. It is possible to play any piece of music in "Real Time" on the keyboard and record it directly on Disk. The Song can be composed of a maximum of 9 MIDI parts (5 Arranger parts and 4 Program parts) and records all the changes made on the control panel of the keyboard, including the Volumes, the Tempo, the Style, the Voices etc. When the Song is played back, it is possible to play with the recorded sequence using any of the 256 voices available. The MS60 incorporates an excellent2 x 22 Watt RMS internal Two way amplification system with Bass- Midrange and Tweeter speakers. The 2 integrated speaker enclosures provide perfect Hi-Fi response over the entire frequency range and a considerably efficient sound reproduction. The internal speakers can be excluded by means of the Speaker On/Off switch. These are special disks in the SOLTON Library that contain PCM Rhythm Grooves coupled to a Style. Thanks to a special control function (SYNGROOVE), the PCM Grooves automatically synchronize with the internal Tempo and with the various Accompaniment sections. In this manner Styles with a particularly penetrating rhythm are obtained, ideal for contemporary dance music. The new, continuously expanding, SOLTON Disk Library for the MS60/MS50 comprises: MIDI SONGS (Words & Music ), MIDI INSTRUMENTALS STYLES GROOVES & STYLES PCM VOICES. The Disk Library created for use with the MS5, MS4 and MS3 keyboards in conjunction with the FD 1 Disk Drive, is completely compatible with the new MS60 and MS50 models.